3/60: West Bay Beach, on your doorstep. 10/60: Guest bedroom with two twin beds. Can be set up as king to accommodate a couple. 18/60: Kitchen with island, great for entertaining. 23/60: View of kitchen from living room. 29/60: Screened porch also includes a large bench with couch cushions for kicking back. 31/60: Screened porch includes lounge bed, bench, dining table and hammock. 34/60: Walkway to the beach. 36/60: We like to keep the sand on the beach, please rinse your feet when entering the home. 37/60: Entry & outside shower. 38/60: Screened porch from outside, banana`s right outside your door. 39/60: Screened porch and entry. 42/60: West Bay Delight, kayak for rent. 46/60: Master bedroom opens onto the screened porch. 48/60: One of the two bathrooms. 58/60: Fresh flowers on your table. West Bay Delight is a beach level unit, newly constructed in the Fall of 2017. It is a 2 bedroom, 2 bathroom property with a spacious, open-concept living room/ kitchen/ dining area, and a large screened-in porch. 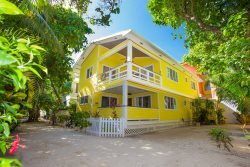 With stylish, tiled floors throughout, island style decor and lots of seating, this home is sure to please those looking for a comfortable getaway with space to entertain - new friends or old! The greatest feature of West Bay Delight is the large, fully furnished screened-in porch. Offering a respite from the weather on hot days, or pests during the dawn/dusk hours, this porch is situated among palm trees and beautiful local plants and flowers. It offers full shade most of the day, with a perfect amount of morning sun and a slight breeze. Guests will enjoy swaying in the hammock, reading on the lounge chair, or dining at the outdoor table which can accommodate 4 - 6 guests. The porch is accessible from the Master Bedroom, or adjacent to the front door of the property. You’re sure to spend a good portion of your vacation out there! The Master Bedroom is very spacious and features a comfortable Queen sized bed, a large closet to store suitcases and a full sized dresser to tuck away clothing / unused items. The Master Bedroom en-suite offers a tiled shower, beautiful bowl sink, vanity and all the towels needed during your stay. The second bedroom has two Twin beds that can be pushed together to form a King bed should guests require. It’s the perfect room for children, friends or a couple. Extra guests may also be accommodated (at an extra charge) using the sofa sleeper in the living room. The home also features a large closet, dresser and full 3 piece, tiled shower en-suite. Comfortable linens, beach towels and bath towels are all provided. The kitchen in this home comes equipped with everything you ned to cook your own meals, with a dining area that can accommodate 4-6 guests. A large kitchen island with bar stools offers additional prep or entertaining space. The living room features multiple large screened windows to allow for a breeze, as well as two matching couches and a good sized coffee table. Enjoy some television or a movie on the DVD player to cap off a day at the beach. All rooms in the home feature ceiling fans, lockable screened windows and individually controlled AC units. Unique to this home is the option to rent an on-site Pelican Kayak. One day, one week and one month kayak rentals also comes with a paddle, adult sized life jacket and optional child sized life jacket. Explore the reef from above! Located in West Bay Village, only 30 seconds from the stunningly beautiful West Bay Beach, this home is privately owned and managed. Guests can contact the owner directly by phone or e-mail for booking information. Lyndsay and Luke were great to deal with. Any issue was addressed immediately. Rates are for 4 persons, the home can accommodate up to 6 using the sofa sleeper. Extra guests are charged $15 per person per night. There is a $60 cleaning fee added to each reservation.